What Is Quartz? What Is Agate? Quartz is found throughout California. Milky quartz veins (often containing milky quartz crystals) are frequently found containing native gold. Miners would typically look for milky quartz as a sign that gold would also be present. Milky quartz itself is not valuable. 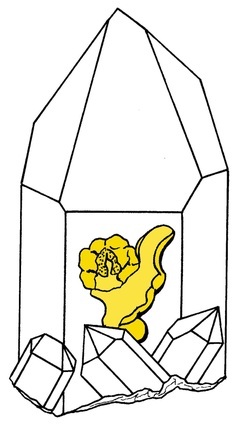 After the gold is removed, the milky quartz is thrown away. Minerals that have no value after other valuable minerals are removed from them are called gangue (pronounced “gang”) by miners and mineral collectors. Milky quartz is a very common gangue mineral in California. To the left is a group of milky quartz crystals on which is attached native gold. This specimen is from a small mine near Sacramento. To the right is a smoky quartz “phantom” crystal. A small, black smoky quartz crystal formed. Later, a larger, colorless quartz crystal grew over the smoky crystal. The smoky crystal now looks like a “phantom” inside the larger crystal. This specimen was found at Peterson Peak (also called “Hallelujah Junction”) on the California-Nevada border. Other forms of crystallized quartz are found in California, too, including citrine quartz, smoky quartz and amethyst.